This one’s really nice. 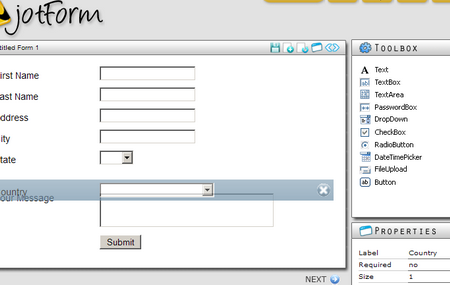 you can edit an HTML form with this interface (click to enlarge). You can literally create a form in seconds. Change names and other attributes of each element in “properties” box. All updates appear instantly in the interface. It’s really nice done. This entry was posted by Jesper Rønn-Jensen	on Tuesday, February 21st, 2006 at 01:39 (GMT-1)	and is filed under AJAX, Usability. You can follow any responses to this entry through the RSS 2.0 feed. Both comments and pings are currently closed. There is a new online form builder / workflow application called The Blue Form. It features a great AJAX style drag-and-drop form builder as well as the ability to assign approval workflows to the forms you create. It is more of a process automation solution aimed at medium sized companies, rather than just an online form builder.